I was planning to get out and drive today, but we had a crisis in the big arena — a pipe broke — and since the backhoe was working, I decided against sharing the road. Tomorrow’s shopping; maybe Thursday. We have a new boarder, at least temporarily. 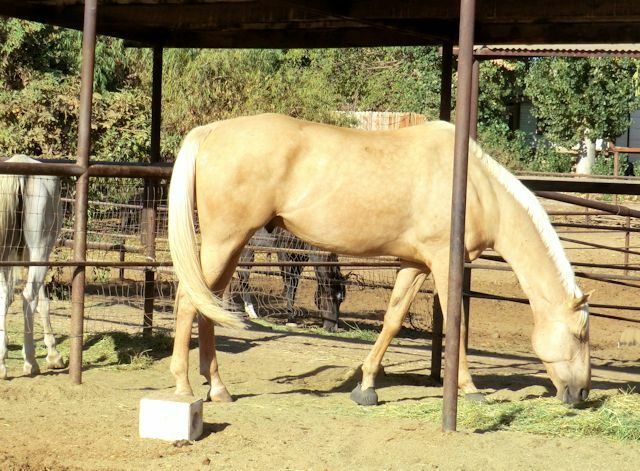 He’s one big ol’ boy; a palomino warmblood. To get an idea of how big, look at where the grey Arab next door comes to on the fence. Then look at where the fence comes to on the new boy. Yep, that’s one big horse. He’s in for a layup while recovering from a hoof abcess. If they were all that size, we’d need a lot more hay! Watching the backhoe dig out the broken water line reminds me of how lucky we are to be able to have family that can handle one. It’d be a lot harder — and a lot less profitable — if we had to hire someone to do this kind of thing. David is very good with the backhoe, and we have our arena sprinklers working again. Earlier, Scott was using it to load manure to haul away. A backhoe is a handy kind of machine to have around. But I still don’t want to share the road with it.